After two years of hearing Brian tell me that I had to get on it, Diane, Brian and I made our way out to the Lower Deer Creek on an amazing spring week. However on the drive up, the clouds rolled in and the rain began. We lucked out with sunshine while paddling, but the night on the river was accompanied by rain and thunder and slugs. A great time. No, but seriously, despite the rain and slugs and thunder, the trip was awesome. The rapids are great, a lot of technical class IV plus some big class IV. To add to it, to scout or portage requires getting poison oak. Makes you want to push your limits of boat scouting and running blind just to avoid that much more poison oak. The scenery on this run is some of the best I have ever seen. 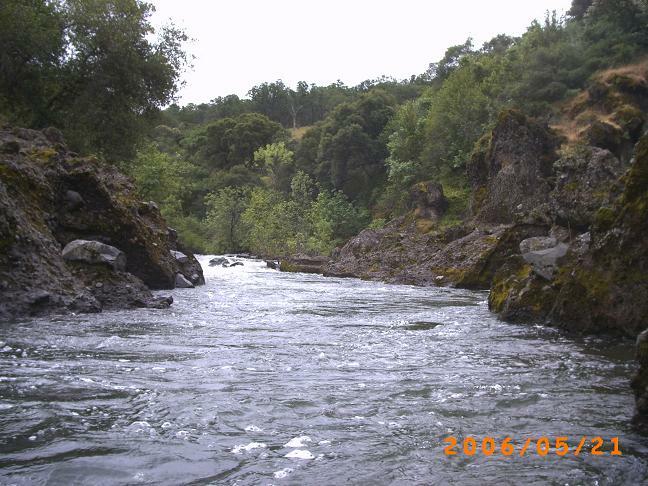 It will require another visit, however, the rapids themselves were good, but not classic, and the poison oak was rampant, because of this I think it will not be a yearly visit. Regardless, it was a good weekend, found memories were formed. Amazing Race. About a half mile below the put in starts a class IV gorge packing 160 fpm. This means the rapids are stacked on each other with only small pools between them. Part One (IV+). The line appeared to be down the center, making a sharp right move. We snuck on the far left then into the center. Scout left. Part Two (III+). A boof off the center ledge that was very friendly. We all tried getting to the left of it, Brian went off sideways and was totally fine. Looks harder than it is. Scout left. Part Three (IV). On the next turn comes this rapid. We hugged the left rock, dropping over the steep section, and then worked left for the final few holes. There was a stickier hole on the right below. Scout left. Part Four (IV). Perhaps the worst consequences of the stretch lie on this rapid. We scouted from the left. The entrance was on the left, working over to a cushion move on the far left. Then a choice: move left into a drop that had a rock in the middle, or head right over a simple drop. In the middle was a sieve that was only in play if you tried to go right, which Diane and I did. 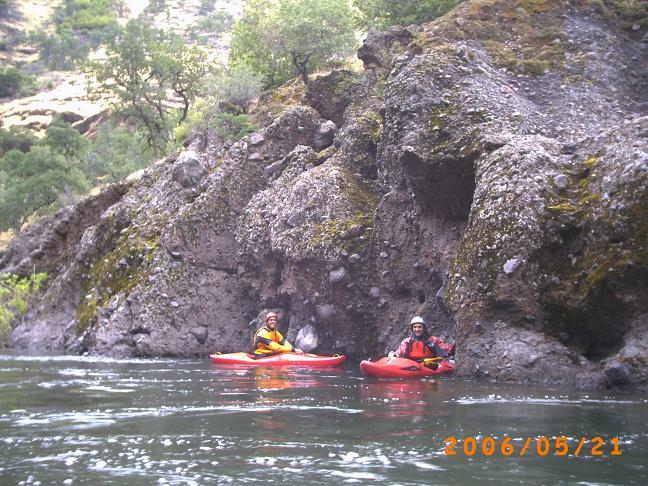 Class III rapids continue for a few miles. Rocky Drop (IV). On a right then left turn comes this drop. 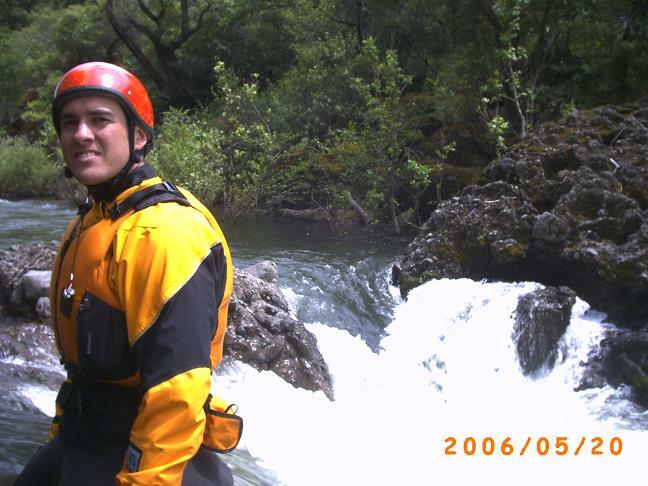 A rocky chute makes this rapid. We ran to the right towards the rock making the bend, getting behind it for a final boof. The center was runnable but rocky, the left was pinched off into a undercut, but could probably go if you forced it. We scouted Right. False Single Drop (III+). A ledge drop we ran on the right, the landing had a rock in it if you were a bit to far to the left, we just ran it without scouting. Lava Dome (IV+). A large bolder bar, looked to go on the right, but chunky and manky. We were going to sneak on the left, but were denied once over there due to being unrunnable. So we planned B, a boat scout and boofed the left of center line, then paddled like hell away from the sieve that a lot of the water went into. Right-to-Left Falls (III+). There were choices at our water level: a “cute” drop on the right, no big deal, a center line which went into a hole, and a left line than slammed into a rock. We scouted from the right island, and ran the right side stuff. Ishi Falls (V-). Two main drops, First boof right, then move right, boof right more, run out the right side moving to the middle. If after the second boof you end up center, you go into a little pinch that is supposedly undercut. Double Drop (V-). A straight forward rapid, it has a somewhat simple lead in through in or holes then into a seven foot boof or so…which lands either on or in rocks. We all portaged on the right. Single Drop (IV). A drop into a large hole which looked like it was better to edge towards the right side of. Left of center was a seam, but just to the left of that seemed to recirulate a bit. There was a sneak on the right of the island which we ran. Boulder (IV-). Enter just left of the bolder at the top. The rest is read and run down the middle. Student Body Left (IV). We scouted from the island. Sneak on the right was good to go. The line wasn’t bad either, start moving left across the river, then finish by dropping back to center. Boulder Bar class III continue for two miles or so, once the power lines are nearly directly over head the next class IV begin. Power line Rapids (IV-). The only rapid of this that stood out as blind was a ledge drop, looked runnable in the middle of the drop. We snuck on the far left. Mi 12:	Finale (IV). A rapid leads into a quick turn. On the turn is a sieved out pinch between a house rock and a smaller rock to its right. It may be possible to ride the main tongue and move to the right around the pile. A sneak was available on the far right. We ran over a boof in the center which was a straight shot out of the rapid. Take out: From highway 99, about 12 miles north of Chico, turn left onto Vina Road. At the T, turn left on Leininger and park near the bridge. Put in: Take Leininger back towards Chico. Hop back on 99, towards Chico, take Keiffer Road (one road south of Meridian road). Take this to the T, and turn left on Cohasset Road. This turns into a dirt road and changed names to Ponderosa Way. Follow this. There are a few spots where the road divides, follow either the sings to Deer Creek painted on rocks, or follow the main road. It isn’t hard.